As you can see, it was originally made by the folks at Direct Dutch (a language school). Overall the concept is a pretty good one. I’ve heard time and time again that Dutch people will switch to English at the first opportunity if they think you are not a native Dutch speaker. They do it for two reasons: they like speaking English, and they want to help you out. Of course, that is a generalization! The one thing I have against the button is the language used: Spreek Nederlands! Met mij! = Speak Dutch! With me! In both languages it sounds very… forward, commanding and slightly rude. It would be better to remove the exclamation points and add a “hoor” after. That word does not have a direct translation in English, but it conveys a friendly tone. Spreek Nederlands met mij, hoor. Time will tell if they make a slightly more friendly version 2. A few days ago, I went to SamenSpraak, hosted by Gilde Den Haag. It is a group that meets the first Wednesday night of every month to speak Dutch. You have both native speakers and buitenlanders (foreigners) intermixed. The event lasts from 5:30 to 7:30PM. I’ve been there a few times already, but this was the first time that I was coming there after finishing up my volunteer job at 5PM. I was tired. Still, what I say below has been my feelings since moving here. 1. Context, context, context. If I can figure out what the main idea of what you’re saying is, I can usually figure out most of the other smaller ideas from the previously figured out context. Of course, this makes it more funny if I am actually wrong about what is the context. This happens sometimes, and usually results in me replying wrongly when you ask me a question about what you just said. 2. My body language gives a lot away sometimes. When I talk with strangers, you can tell when I am nervous about not understanding what you’re saying. I fidget, I cross my arms in front of me defensively, I play with my engagement ring, and I lightly dig my nails into the side of my other arm. 3. Sometimes I pretend to know what people are saying. I laugh when everyone else does. This mostly happens in groups, rather than with one to one conversations. But I mimic the reactions of the people around me (like laughter or looking concerned) even when I don’t have a clue what was just said. Mostly while thinking: Oh boy, what if they realize I have no idea what is going on? Yesterday around lunch time I went to the Brainwash hair salon in Leyweg to get my hair cut. My bangs (pony in Dutch!) were definitely too long and getting in the way. The wait was a bit long, but for a price of only €16.50 it was worth it. I didn’t speak a word of English while I was there (a new personal record! ), although there were a few sentences the stylist said where I did not understand. nod and smile = the life of an expat. Today I went to the library as my books were due on Monday and I didn’t want to renew them again. I figured I had them long enough as is. It was a book with 800 words to study and a book about Dutch word order (sadly – not as good as I hoped as I knew most of it already but still have problems with that grammar area). But anyway. This meant using the book return system for the first time. I knew where to take them, but I wasn’t sure how to use it. Basically you walk up to it and put in your item (Let op! Één item per keer – caution, one item at a time) on the conveyor belt inside. Before you put the item on the belt, the area is lit from above by a green light. Once you put in the item, a wall of plastic descends and the light changes to red. (Yes, I wasn’t paying 100% attention and tried to put in the 2nd item too quickly, but it only hit the wall of plastic). 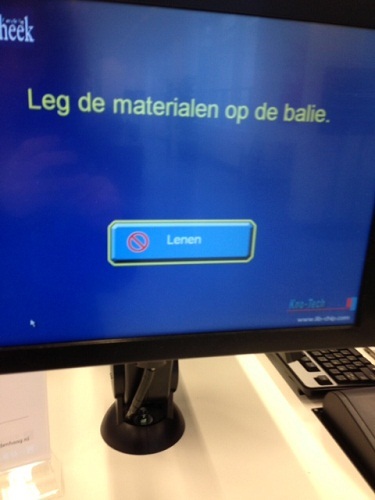 The items you return are automatically scanned and displayed on the computer screen above. Another cool service. The screen basically just says to place the material on the desk. It will automatically scan it from beneath. After that, it asks you to scan your card, and then it prints your receipt when you’re done (automatically this time!). So, a fun day (or two) at the hair salon and the library. Who would have thought! As I have previously mentioned, in my A2 class at the Volksuniversiteit I am using the Contact 1 textbook. If my memory is correct, the A1 class finished chapters 1 through 4. My current plan is to get through the first four chapters before next week’s class on Tuesday night, but we’ll see how that goes. Each chapter is split into three sections – A, B, C. I am currently at 2C after about six total hours of studying (it never ends!). So far it seems like the “A” section of each chapter is pretty easy, and then the “B” section has medium difficulty, and finally the “C” section tends to take forever to finish due to its emphasis more on speaking and listening. Chapter 1: Waar komt u vandaan? = Where do you come from? which covers names, nationalities and the country you came from. It also covers your address, town, age, birthday, the alphabet, counting, and talking with someone (formally and informally). Chapter 2: Zullen we iets afspreken? = Shall we make an appointment? (i.e. shall we do something? ), which covers how someone is feeling, the days of the week, times, opening times for businesses, and filling out forms. The last section is set in a restaurant: reading a menu, ordering, saying there’s something you don’t understand, and etc. Of course, 95% of it is review for the next class, but every once in a while something slips by that I didn’t know (or remember). A funny example I came across is how to say how you are doing. Het gaat wel does not, unfortunately, translate into “It goes well” as an English speaker might expect. Wel is not well. It’s closer to “okay”, so if you tell someone “Het gaat wel” it is a slightly negative response.